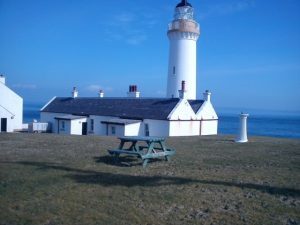 The Cantick Head Lighthouse is an active 19th century lighthouse on the Scottish island of South Walls in the Orkney island. 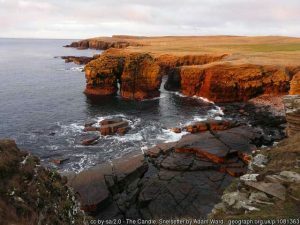 It is located at the end of Cantick Head, a long peninsula on the south-eastern coast of South Walls that overlooks the Pentland Firth and the Sound of Hoxa, which forms the southern entry to the natural harbour of Scapa Flow. 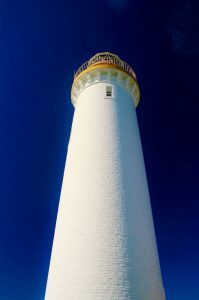 The light first entered service in 1858, and consists of a 22 metres (72 ft) high cylinder-shaped tower, which is painted white. It supports a single gallery and a lantern with a black cupola. Adjacent to the tower are a set of keeper’s cottages and subsidiary buildings, bounded by a walled compound containing a sundial. A principal keeper’s house was a later addition. In 1913, a foghorn was installed at the station, which continued in use until 1987. 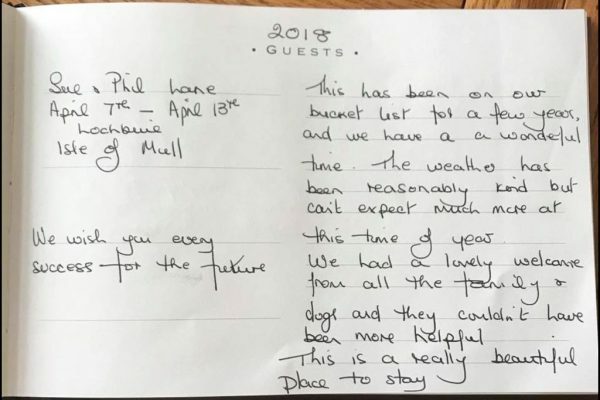 In 1991 the light was converted to automatic operation, and the keeper’s houses were sold and converted to holiday accommodation. Among other attraction in the area is a Neolithic chambered cairn just 200 meters from the lighthouse. 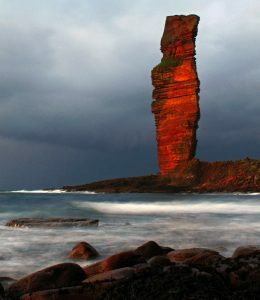 The Old Man of Hoy is a 449-foot (137m) sea stack on the island of Hoy, part of the Orkney archipelago off the north coast of Scotland. 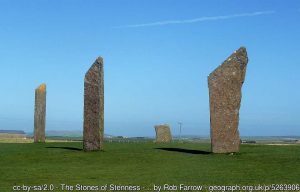 Formed from Old Red Sandstone, it is one of the tallest stacks in Britain. The Old Man is popular with climbers, and was first climbed in 1966. Created by the erosion of a cliff through hydraulic action some time after 1750, the stack is no more than a few hundred years old, and may soon collapse into the sea. Shop 2 miles J M F Groat & Sons, next to the harbour in which Longhope lifeboat is moored. This shop seems to have everything – food, drink, newspapers, a Post Office.